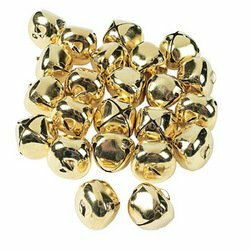 Metal Goldtone Jumbo Jingle Bells. (2 dz./PBH, 6 PBH/unit) 1 3/8" These are great for your next party or event. Make great craft projects for Christmas. Use your imagination with these jumbo bells. Jingle, jingle, jingle.